Falls City was a major brewery in Louisville, Kentucky (thus its name as the city sits upon the Falls of the Ohio) and was one of the two big local competitors for the "Kentuckiana" market and other surrounding states along with Sterling Brewers in Evansville, Indiana. 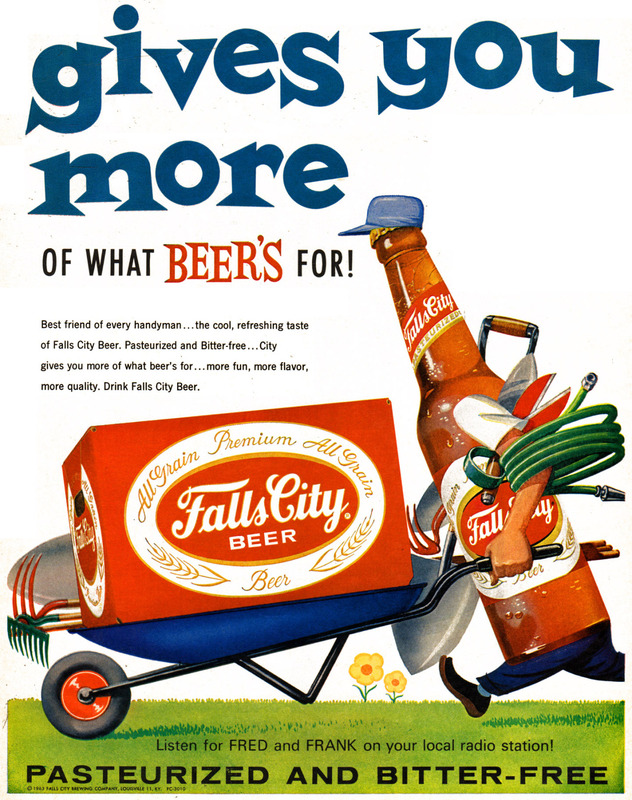 Like many regional breweries, Falls City had many heights including being the official beer of the Indianapolis 500 and the company that developed that infamous product during the Carter administration, Billy Beer. Despite the brewery deciding to go out of business in the face of the big national competitors, Falls City has managed to stay around in both the Louisville and Evansville areas. Since 2010, it has been contract-brewed by Sand Creek Brewing Company. Posted in 1960s, Retro/VintageTagged advertising, alcohol, Americana, beverage, bottle, drink, illustrationBookmark the permalink.